Sagara Okiku, ANBU’s fourth commander, was having a good morning. The twins had slept through the night. Mariko had scampered off to the academy on time, with a completed report on Tetsu no Kuni’s military samurai tucked under one arm. And Ikorou, kind husband that he was, had packed Sagara a bento. It was currently sitting in her desk drawer, a pleasant temptation. She had even, through some miracle she didn’t plan to examine closely, managed to catch up on her paperwork. In this frame of mind, she was almost forgiving when the entirety of Team Six — and two dogs — invaded her office, instead of the one lieutenant she’d actually summoned. Who appeared to have come straight from the training field, judging by the motley collection of filthy, blood-stained clothing. None of them were in uniform. Shiranui seemed to have been punched in the face. Namiashi’s cheek was gashed. Hatake looked like he’d been dragged through barbed wire. Only Tousaki was visibly uninjured, which probably meant he was concealing something internal. “We’re here to report, too,” Tousaki said, nervously stubborn. His defiant gaze made it as high as Sagara’s tea mug. The tall yellow shepherd sat down in front of Shiranui, feathered tail coiled neatly around her feet. Her head reached his ribcage. The pug draped over Shiranui’s left shoulder sat upright and scratched one ear. Hatake, less demonstratively, slouched behind Genma and maintained the relatively successful pretense that his summons’ actions had nothing to do with him. Namiashi tucked his arms behind his back, spine held ramrod straight, and didn’t move an inch. The last meeting involving Team Six had ended with Namiashi’s temporary removal. Sagara supposed she could understand the closing of ranks, though it did come within a breath of insubordination. “Vice-commander Kuroda has submitted a formal complaint about your conduct, Shiranui,” she said. Shiranui went just slightly pale. Tousaki’s jaw clenched. Namiashi glowered. Hatake fixed his one grey eye on Sagara, and waited like a bear trap. Tousaki stared at her. It was much the same bewildered expression Mariko got, when she’d wound herself up into a screaming fit and Ikorou neatly diverted her the moment before she detonated. Except adult, male, and fractionally more dangerous. “You believe us?” he said finally. “Is there a reason I shouldn’t?” Sagara asked. Namishi’s hand clamped down on Tousaki’s shoulder. This time, Tousaki allowed himself to be quelled. Shiranui stood like a pillar, relief and shock like ripples underneath the blank mask. The next time Minato made a glowing comment about the singular intelligence of his protege, Sagara was going to repeat this meeting verbatim. 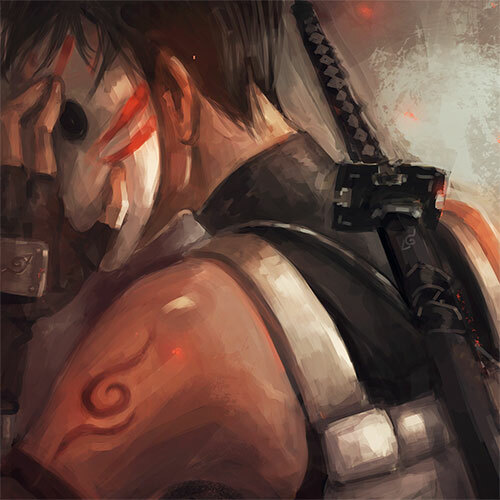 Hatake was white behind his mask. The dogs had frozen. Sagara held his gaze until he dropped it. He didn’t bow, but he didn’t look up again either. They were painfully young, but they’d been adults since they’d taken their first kills. There was no space to coddle them, and Sagara wouldn’t have even if there had been. You didn’t grow strong trees without harsh winters. Namiashi and Shiranui were only a breath older, and their shoulders carried much more weight. There was even less space for them, and Sagara had already taken more time than she could afford on a matter so irritatingly pointless — but that was Kuroda’s fault, not theirs. She’d already spent her time on him. It had been satisfying. Shiranui’s relief had faded somewhat. He said, low but clear, “No, Commander. Thank you, Commander. I apologize for my teammate’s outbursts, and for the trouble I’ve caused you.” He bowed as deeply as Tousaki, and straightened with a formal salute. Shiranui seemed a little numb. Namiashi herded him and the subdued rookies out, trailed by the golden shepherd, who paused to give Sagara a dirty look at the threshold. Loyalty, Sagara reflected, was a lovely thing. She waited until the smudges of chakra and ANBU sparks faded from the edge of her senses, then got up and went to stick her head out of the door. At his desk, Naofumi ducked his head sheepishly. “I should fire you,” she said. Team Six walked back to their own office in a peculiar caul of silence. Ryouma contrite in the wake of his chastisement, Kakashi withdrawn into himself to tend the knife wound Sagara’s indirect reference to his father had opened, Raidou tense like a storm cloud looking for a place to ground its electric charge, and Genma holding a precarious grip on outward calm, trying to sort a dozen conflicting feelings into neat piles. The dogs were just as subdued. Kin trotted anxiously at Kakashi’s heel, tail low. Pakkun rode Genma’s shoulder with his head turned to keep an eye on his summoner. Genma had been prepared for an official inquiry. There’d been no question that Kuroda would file charges. He’d been braced to be told he was suspended, like Raidou had been. He’d even made lists and labels for everything in his desk and all his medical gear, to make an easier transition for his replacement, if it came to that. He hadn’t expected a blank dismissal of the whole affair from the Commander. Or for Ryouma to charge into the fray with a hot-headed defense. An evidently unnecessary hot-headed defense. And he definitely hadn’t expected Kakashi to step in and stand with Ryouma on the matter. Of course the rookies had insisted on coming into his meeting with Sagara, so in retrospect, he should have seen it coming. He’d been too narrowly focused on his own concerns to notice, and by the time he had, it’d been far too late to stop it. Even though he should have. A secret part of himself was glad he hadn’t interrupted Ryouma’s passionate defense. Glad he’d stood dumbstruck to hear Kakashi’s stolid pronouncement that Ryouma wasn’t wrong. And he didn’t know what to do with the warm, curling gratitude towards his rookies that came with that, either. He waited until they were safely behind closed doors, in the familiar windowless cave of Team Six’s office, to even properly breathe. The carpet and the back of the door were still stained with the coffee he’d thrown after that first disastrous meeting with Kuroda. Katsuko’s desk was still in place, covered in her doodles, marking her absence. But it wasn’t the same office. It wasn’t the same team. He lifted Pakkun down to the floor, leaned against the door, and studied his comrades: Ryouma with his impetuous temper and malignant self-doubt; Kakashi, aloof genius with a secret heart of glass; Raidou, competent and generous, and ready to do battle with the gods themselves if someone he cared about was at stake. He reached for Kin, who obliged, pressing her whole body against both men’s knees in a reassuring bulwark. “I know.” All the neat piles of thought and feeling Genma’d managed to sort out washed together like a sand castle crumbling under a wave. He took a breath, letting the air out slowly, leaning against Ryouma as much as the back of the couch. Kakashi made a low sound of agreement and folded himself to the floor at Ryouma’s feet, slouching against the couch. He didn’t look up, even when Kin dropped her nose questioningly to his shoulder. Pakkun clambered into his lap, stretching out with paws against Kakashi’s thigh and raised dark eyes towards his summoner’s masked and moody face. Raidou rolled his chair over from his desk and sat opposite the couch, keeping all three of his teammates in his sight. The matter was not, would maybe never be, closed. All true. Reasonable, logical, and undeniable. She’d tried to kill Team Six, lost her whole team and her arm to them, and then reluctantly turned traitor on her own country and joined them, all in order to secure a future for her sister and niece. Which she had. Kimiko and Sango were alive and safe, well out of Mist’s clutches and the threat of genocide. Raidou’s chair creaked. He leaned in and dropped his hand squarely over Genma’s, covering and stilling them. His voice was warm and quiet, and filled with conviction you could sharpen steel on. “There’s no blame on anyone. You did the best you could. That’s enough.” Even when Raidou sat back, Genma could feel the heat of his leg pressed close. Genma had broken in front of his team once, and regretted it. He tipped his head back and stared at the ceiling until his eyes didn’t feel like they might water, and his voice felt like it might be his own. There was no reason for him to be so emotional now, when the threat Kuroda had held over them was gone. Absolution had been given by the commander herself. The matter is closed. “Never thought I’d see the day I got this attached to a Mist ninja who’d tried her best to kill me and my team,” he said, trying for humor. He missed the mark by meters, but sometimes it was the attempt that mattered. “You can join,” Ryouma said. He wrapped an arm around Genma’s shoulder and tugged hesitantly. Kin clambered into Genma’s lap with considerably more confidence, planting giant forelegs on either side of his waist and nosing at Genma’s jaw until he tipped his head towards her. One betraying tear rolled down his cheek. She swiped it away with a rough lave of her tongue. When that didn’t dissolve him into instant happiness, she plied it again, licking at the side of his face with delicate enthusiasm. She was even careful of his bruises. Kin huffed delightedly and licked his ear, and then what she could reach of Ryouma for good measure. Raidou unsuccessfully tried to swallow his laughter watching them. His leg, lodged against Genma’s, trembled with it. “Kin is my secret weapon,” Ryouma announced. “We’ll start Kakashi on daily soldier pill doses so he’s got enough chakra to summon her all the time.” He pulled Genma’s head against his chest, and wrapped his other arm around Genma’s shoulder, holding Genma in a solid embrace. Even through his swollen nose Genma could smell the sweat and dirt of their workout, and under that, the perfume of one of Ryouma’s expensive soaps. Hard muscle and bone that could break a man in half, and hands that could rot flesh with a sickly energy, were a comfort. And that shaking leg pressed against his was safety. Even the sullen grumble rising from the floor was reassuring. Endearing. This was his team. They’d been his team since day one, of course. But somehow, without Genma knowing quite when, he’d become theirs, too. He clamped one arm around Ryouma’s side, pressed his knee against Raidou’s, and reached a hand down to brush Kakashi’s unruly hair. He didn’t know if his face was damp from laughter or relief, or just Kin’s generous licks. And he didn’t care. The air tasted of salt. Kakashi held still while Genma touched him, waiting for a cue, but Genma just ruffled him once, carefully, and let his hand rest on Kakashi’s head. Kin stretched out, draping over Genma and Ryouma like they were her personal mattress. There was laughter. Kin’s tail thumped against worn leather. Genma hadn’t been suspended. That was good. Kakashi’s chest was full of splinters and blood on the living room floor. That was stupid. You just display your vulnerabilities. This was not his moment. It was Genma’s. He breathed out and settled himself. Pakkun’s paws kneaded against his thigh, blunt claws, and Genma was laughing. Pay attention to that, Hatake, god. Ryouma’s hand curled over Kakashi’s other shoulder. He knew the story. Kakashi had told him. It all happened a long time ago. You don’t need to make me feel better about it. Mostly because there wasn’t better. There was just dead. Kakashi slipped out from under their hands, carefully shedding Pakkun. There was a quarter of sofa left behind Ryouma, another quarter next to Genma, and Raidou looking worried in his own chair. Genma’s bruised face was tear-streaked. Ryouma’s eyes were shadowed. Kakashi sat down behind Ryouma, pulled his legs up, and rested his forehead between Ryouma’s shoulder blades. It wasn’t a hug. It was a lot more like hiding. Ryouma was solid, his shoulders were broad. Like any shinobi, he wasn’t entirely comfortable with someone right against his spine, but he only tensed a little. After a moment, he settled and tilted his head back, just enough that the back of his skull brushed against the top of Kakashi’s head. Kakashi exhaled. Breathed in sweat and blood and Genma, that goddamned soap, something like stormclouds and thunder. Pakkun leapt lightly onto the sofa, and curled up in the scant space between Kakashi and Ryouma, not quite touching either of them. Leather creaked and dipped when Raidou sat down on the other end. It was just the four of them and two dogs, in a windowless office that felt gutted around Katsuko’s abandoned desk. “That’s because you’re a morning person and don’t mind 5AM training,” Kakashi muttered. Also true. Kakashi breathed out against Ryouma’s spine, and didn’t respond. After a moment, there was a rustle from the other end of the couch, and Raidou’s fingers didn’t quite brush his shoulder. “Doing okay, Hatake?” Raidou asked. There was an answer, and it was stupid. Kakashi made an almost inaudible canine sound. Kin immediately scrambled to her feet, to the squashed protests of his teammates, shook herself violently, and flopped down the other way, so that her fore-paws dug into Raidou’s thigh, and her haunches rested on Ryouma’s lap. Genma, in the middle, was thoroughly flattened. Raidou’s hand had vanished to deal with Kin’s claws. Genma, bulwarked on both sides by his strongest teammates, and covered in a blanket of warm dog, was laughing again with a crack in his voice. Ryouma freed a hand — to shove Kin off, Kakashi thought, but Ryouma reached behind himself and cupped his palm around the back of Kakashi’s neck. He didn’t do anything else. He just held there, bleeding warmth through Kakashi’s mask. It shouldn’t have helped, but it did, and Kakashi had no idea what to do with that. Nothing, it turned out. The four of them sat like that, in cycles of silence and soft jokes, while Genma slowly re-grounded and Kakashi remembered how to pull himself away from the drowning dark. Kin dozed with her head settled on Raidou’s hip. “I’ll get it,” Pakkun said, with a tongue-curling yawn. “How…?” Raidou began, but fell quiet when Pakkun extracted himself and a moment later, the door clicked open. Out in the hallway, someone made a startled sound. The couch couldn’t be seen from the door, but even so, there was a brief flurry of startled activity before Genma made it to his feet. Kin slid away, looking reproachful. Ryouma tightened his fingers on the back of Kakashi’s neck, then dropped his hand. He glanced at the door, but the runner must have already headed off on their rounds; Pakkun was turning away, yawning again. Genma grabbed a senbon out of a pencil holder on his desk and clamped it between his teeth. “That’s Dad.” Genma shrugged, stiff-shouldered, and turned for the door. There were no shortcuts through ANBU HQ’s mazelike hallways, no windows, no signals of time or direction. Ryouma still got lost sometimes, on floors he didn’t know. They walked quickly, the click of dogs’ nails lost in the dull carpeting, taking the stairs up to the lobby instead of waiting for the lift. A skinny genin waited by the front desk, soaked to the skin and still slightly dripping. Ryouma threw a startled look out the lobby doors. The morning’s sunshine had fled; lightning-lit rain lashed the hard-packed ground outside. Genma’s pace quickened. The genin straightened automatically, then took a wary second glance at their muddy training gear. She seemed disappointed; maybe she’d expected full armor and masks here in ANBU HQ. But she recited her message in a professional, well-rehearsed monotone. “Who’s Watanuki-san?” Ryouma asked, bewildered. “You’d clean up for your landlord but not the Commander?” Ryouma asked. Evidently, he needed to make a good first impression. Raidou stirred uneasily. “This is your new apartment, Genma?” He sounded as if he was pretty sure it wasn’t worth a rent cut. “A lot of view,” Kakashi muttered. “Through the new skylight,” Pakkun added. “Great-grandfather was,” Kakashi said softly. His hand dropped to Kin’s head; she leaned against his thigh, her plumed tail slowly wagging. He did have sharp teeth. Ryouma had seen them once, stained with blood, through the tatters of a shredded mask. He reminded himself not to stare. “You may scratch my ears,” Pakkun allowed. Of course Genma would worry about a roofer. Kakashi and Ryouma exchanged long, speaking glances. Lightning flashed, brightening the lobby for a perilous second. Thunder cracked so loud overhead that Kin yelped. Ryouma had never seen a dog preen before, but Pakkun managed it. He sighed, scooped up the pug, and tucked Pakkun under his tee-shirt. Genma and Raidou were almost out the door, following Kakashi. “Stay here until the rain lets up,” Ryouma advised the genin. “Good luck, then,” Ryouma told her, and darted out into the rain. He was soaked instantly. Pakkun’s hard little claws scrabbled against his chest, finding a comfortable perch; his head popped briefly out of the collar of Ryouma’s shirt, then retreated. “Wouldn’t object to a translocation,” he rumbled. “My stomach would,” Ryouma told him. He narrowed his eyes to slits, focusing on distant figures in the rain. Kakashi had translocated. It figured. The run to block nine of the warehouse district was fast and slippery and very, very wet. Most of Konoha’s citizens had cleared off the streets, waiting out the storm in their homes or restaurants or beneath shop awnings. Ryouma skidded on street corners, streaked over puddles, and arrived at a long, two-storey building with a concrete-block lower floor and a traditional wooden first storey. Missing tiles gaped on its slanted roof. Near the ridgeline, an enormous hole yawned. A slim, dark figure crouched next to it, and chakra itched at Ryouma’s senses. The officers were down below, crowded into a narrow entry porch behind sliding wooden doors. A round, middle-aged woman in a drenched happi coat was trying to explain. Genma’s shoulders sagged in relief. Genma glanced sharply back at him. The senbon clicked between his teeth, an exasperated sound Ryouma already knew. “Watanuki-san and I have an agreement about my rent, provided I complete the interior renovations. If my team and I add in the roof…” He eyed her expectantly. Apparently negotiations were best left to the master. Ryouma shrugged, eased Pakkun out of his shirt, and set the pug on his feet in a dry corner. After a second’s thought, he peeled out of his sodden shirt, too, and hung it on a protruding nail. “We can come back on a sunny day, too,” Ryouma told her, and headed out to join Kakashi on the roof. Genma had to hand it to Ryouma — he knew how to work his natural advantages. Watanuki-san trailed after Ryouma, shielding herself from the rain with a bit of cardboard, and watched every second of his effortless climb up the side of the building. Pakkun, who had more sense and greater immunity to Ryouma’s charms, went further inside, where it was dry. “You can fix the roof today?” Watanuki asked. No rent was a much better deal than the fifty-seven thousand ryou-a-month Genma’d already negotiated, and even that was half of market. Genma smiled, and felt his lip split open again. “Training,” Genma said. “This is Namiashi-san. And that was Tousaki you were just talking to.” He glanced into the dim interior of the warehouse itself. Rolls and mountains of cloth stacked nearly to the roof in some places formed neat aisles, except for the area right under the jagged, splintered hole that marked where the roofer had come through the floor above them. Water pooled on the floor, tinged reddish with either dye or blood; Genma hoped it was the former. Several bolts of cloth were soaked with rainwater and leaching color from the silk into the protective muslin coverings over them. Raidou had headed straight for the hole, looking up with a practiced eye. His mother Ume had talked at length about Raidou’s skill as a handyman, that day six weeks ago when Genma had stopped by to give Raidou the news about Katsuko. It seemed like yesterday, and at the same time, like it had been months. “Do you already have the materials for the repair, Watanuki-san?” he asked. “The floor was something I was already planning to deal with. I’ll just be doing it a little sooner than I’d expected,” Genma said. He left Raidou to his inspection and followed his new landlord to a small office near the door. “Just me, Watanuki-san. But I’m not by myself for the work. Namiashi-san is a skilled carpenter.” He gestured at Raidou. “And my other two teammates are already hard at work.” The scrape of tiles overhead suggested Ryouma was stacking them, or counting them, or otherwise making sure the roof job could proceed. If Asuma decided he wanted back on the lease, well, that was something they could negotiate when the time came, too. It looked a lot more like wet rot to Genma’s untrained eyes. “Everything? The whole entire floor?” Because that was going to be far more lumber than just the little patch job Genma’d anticipated. It’d eat up even the free rent in no time. Watanuki-san looked pained, too. “It is an older building,” she said. “At least this section.” Raidou indicated a broad area around the hole where the wood looked dark. Genma sighed. “Can you check the rest of it from there?” he called. Watanuki took a few steps and flicked an industrial-looking switch on the wall. Electric lights flickered and came to life, bare bulbs shining in rows down every aisle. Raidou started down one of the joists, walking a few upside-down paces, stopping to poke the boards at his feet with his kunai, and repeating. Watanuki went back to writing out the new lease. There was a thump from overhead, and a crashing sound. “Watch out,” Ryouma called. Dust cascaded down through the hole, and a broken piece of tile followed it, shattering on the cement floor. When Raidou got back with the immensely relieving news that the worst of the rot was all in that area near the front, Genma signed the new lease. He also promised they’d move the bolts below the hole out of harm’s way before they got started in earnest. A few bows later, and Team Six was alone again. Two in the raging storm on the roof, two standing amongst stacks of silk cloth worth millions of ryou. Genma and Raidou shoved broken boards into a pile, moved the spoiled bolts to a corner outside Watanuki’s office, and tossed fresh canvas over the remaining inventory. Raidou didn’t wait to see if it was a lightning strike on the transmission line or a short in the building; he snapped the switch off. “Maybe,” Raidou said, without any conviction. They made their way through the dark aisles to the back door, near the stairs. Raidou stepped out into the rain to tug the main block free from the fuse box. He wasn’t immediately electrocuted in the attempt: that was reassuring. It still felt a little odd to use Raidou’s given name, like maybe Genma ought to seek permission first. But they were off the clock now, and in Genma’s own soon-to-be home. He led the way up the stairs, slid open the unlocked door at the top, and led Raidou and Kakashi’s dubious dog inside. “Wish I’d thought to bring a flashlight.” The upper story was one big, empty space, the same area as the floor below. It had slatted windows on all four sides, letting the gloomy light in where the shutters were open. And of course, there was the new ‘skylight’. Kin’s head poked in through the gaping breach in the roof, mouth open in doggy enthusiasm, and then she bounded through, chakra walking across the ceiling until she was well clear of the rotten section of floor. The timbers trembled under Genma’s feet when she leapt down. She rushed over, tail whipping back and forth so hard her whole back end shook with it. When Genma reached a hand out to pat her, she barked once, then shook violently, flinging water droplets everywhere. “I’m not sure that counts as helping,” Genma told her, when she’d finally stopped. She just wagged harder and licked his hand. “Hatake, your dog is a menace,” he called up to the roof. Genma glanced around the space at the neat stacks of lumber, nails, screws, and gods-be-praised, tools. There was rough framing around a space that would be the bathroom, once it had walls. A new toilet and sink were already installed. Sharing the plumbing, a shower was tucked against the outer wall, tiled and ready for use as soon as he put up a shower curtain. The soaking tub next to it was a luxury salvaged from a house in the Uchiha compound that was being remodeled — it was good to have friends in the clans. In the area that was going to be his kitchen, there was a gas range — second-hand but in beautiful shape — that Asuma had found, and a butcher block sideboard and large enamel basin, with hot and cold taps gleaming on new lengths of copper pipe. ‘That part’ being the section around a large, contractor-shaped hole. Other than that small detail, it was fine craftsmanship. Asuma had left the village? But— Genma hadn’t said a word. How many other little hurts didn’t they know about? Raidou had wondered that about his own apartment occasionally. He was holding out hope that the previous occupants had retired gracefully, gotten married, and gone on to raise kids or chickens, depending on their personal preferences. It was a nicer thought. “Good thing I’m a medic,” Genma said, mouth curling in a way Raidou decided not to read into. Raidou grabbed that distraction with grateful hands and made his way up to the roof. He took the shortcut through the ceiling-hole, while Genma went around outside to use the contractor’s ladder. They found Kakashi sitting Buddha-like on the apex, keeping up the rain-shield. Ryouma crouched by the hole with a collection of tools on one side, building materials on the other, and the expression of a man who was pretty sure he needed to hammer something, but hadn’t decided what. “You put things down and nail ‘em, right?” Ryouma said. That would be a ‘no’. “I’ve built things,” Kakashi said. Raidou rubbed the back of his head. Construction projects were supposed to be a staple of genin D-rank missions, but Kakashi had been a genin for about a minute before he’d made chuunin and joined the war effort. And Ryouma’s early shinobi career had been a trainwreck; Raidou doubted he’d spent any of it studying the pictures in construction manuals. He gave them a rapid breakdown of trusses, battens, the necessity of a good underlayer, cleating, and how to measure the proper distance for laying down ceramic tiles. (“Starting by not dropping them on your teammates.”) The contractor tools were clearly old and well-used, but equally well-cared for. Ryouma, unleashed with the hammer, made short work of replacing the shattered battens and cleating the underlayer in place. Kakashi slunk down to take command of the measure-stick and tile placement, which seemed to please some meticulous little corner of his soul. Genma, who had done minor construction during his genin days, crouched down at Raidou’s side, asked more pertinent questions about tile structure than Raidou was actually capable of answering, and liberated the hammer from Ryouma to nail in the final row. The result was a tidy patch job of lighter new tiles among the older, weathered ones. “Keep holding that jutsu,” Raidou told Kakashi. Raidou, Genma, and Ryouma dropped down off the roof, went back inside, and clambered upstairs to stand around the ragged hole in the floor. Genma held up a glowing hand to cast some additional light through the dim room. Chakra rippled and vanished. Rain hammered down, striking like handfuls of iron filings. The patch remained water-tight. “You’re welcome,” Kakashi said, dripping two feet behind Genma’s back. Genma didn’t, quite, twitch. Kakashi threw the recently abandoned shirt at Ryouma’s head. Ryouma caught it absently, stuffed it in his back pocket so that it dangled down, and looked around the loft with interest. “You could fit the whole team in here,” he said. “The plumbing’s connected,” Genma said, with a sidelong look at their one-eyed beacon of cheer. “If you need to use the toilet, be my guest.” He gestured affably at the unfinished cage of studs framing one corner of the loft, which would eventually be a small toilet and a large bathroom. The little pug wasn’t wrong. The storm, for all that it howled fiercely, was oppressive and muggy. With the roof closed up, the air inside the loft was still. They were all soaked to the bone, but Raidou still felt like he needed a shower. Genma pulled at his own shirt-front, peeling nearly translucent cloth away from skin. Kakashi sighed. “Fine,” he said, and performed the strange little justu that pulled the water right out of their clothes. He dumped the extracted rain into Genma’s new tub — which was apparently where Kin had been resting, since she bounced up with a damp, offended bark. Now it was Kakashi’s turn to snort. That worked. Raidou nodded and crouched to take a closer look at the hole in the floor, envisioning just how many boards they’d need to rip out. Raidou rectified that quickly, and a host of other new experiences: ripping up rotten floorboards, clambering between joists, pulling nails with a cat’s-paw prybar and hammering them in again to strengthen a damaged joist with a heavy ‘scab’ board. They tracked down the nearest load-bearing beam and stood on it together — first Ryouma, then Kakashi and the clone — until Raidou determined it was capable of safely supporting the lieutenant’s home. The still, muggy air grew hotter as they worked. Kakashi cracked a window, but rain swirled through until the wind blew it shut. Raidou peeled off his shirt. Kakashi kept his shirt and mask, stubbornly, though a dark patch of sweat spread between his shoulder blades. By the time Genma returned, they were bickering over the orientation of the new floorboards. “They won’t match,” Ryouma said, looking at the dark, age-polished expanse of boards stretching toward the kitchen area. “I’m coming.” Pakkun burst out of the bathtub, where he and Kin had taken shelter on the cooler surface, and galloped for the kitchen sink. Hammering was starting to lose its appeal. But Genma dumped the ice in the sink, stashed the drinks — and Pakkun — inside, and came back, shedding his rain-resoaked shirt as well. His torso was pale in the dimness, leanly muscled. He took the spare hammer from the clone, stuck two nails between his lips, and knelt down beside Raidou at the far edge of the hole. Raidou’s skin was summer-brown already, evenly tanned over solid, sharp-cut muscle. Genma had the ANBU tan: darker shoulders, ivory chest. The ridged scar on his belly was still pink with newness. His clone hefted a board off the stack and levered it down, and Raidou and Genma leaned in together to slot it against the next. Ryouma looked away. “Think we can beat ’em?” he asked Kakashi, half at random. Melting ice cubes sloshed sulkily against enamel. Ryouma glanced back over his shoulder and saw Pakkun peering dolefully over the edge of the sink. Apparently the temptation of beer wasn’t enough to venture out, though, because Pakkun rolled over after a moment, all four paws sticking up in the air, and began to sing. He had a strong bass, and no sense of tune. Ryouma was pretty sure those hadn’t been the original lyrics, either. “Hope he didn’t pick up his singing skills from you,” Ryouma told Kakashi, reaching for the next board. “Now you’ll never know,” Kakashi said, but he flicked a glance back, and shaped a fast handful of seals. Chakra lanced out. The water in the sink rose, an ice-studded wave, and fell again. Pakkun’s singing broke off in an indignant yelp. Challenge glittered in Kakashi’s eye. Ryouma scrambled to catch up. Genma’s clone gave an unfair advantage, and Raidou knew what he was doing, but Kakashi was fast and Ryouma was determined. They fell into a rhythm, Ryouma placing the boards, Kakashi setting nails a precise thirty centimeters apart. The other side of the hole grew closer. Sweat slicked Ryouma’s hands, left damp prints on the boards, dripped into his eyes. He met Kakashi’s eye across the board and grinned at him. Kakashi grinned back, sweat-damp mask crinkling, eye alight. His hair was damply spiked, clinging to his temples and the side of his head. His hands never faltered, setting the nail, driving it in with two quick blows, moving on. The clone looked pointedly at the new patch of floor, measured the stretch of raw boards on either side of Genma and Kakashi, and quirked a brow. Genma rocked back on his heels, wiped sweaty hair out of his eyes, and laughed. The clone popped like a soap bubble. “Still want to hear?” Ryouma asked. Adrenaline fizzed in his veins: victory without the fight. He bounced up, testing the new boards, and they held. The lights came on. In the warehouse below, someone whooped. Ryouma stood, blinking stupidly, eyes slitted against the sudden glare from unshaded overhead bulbs. Kakashi was looking at him, head tilted slightly, as if he were still waiting to hear. Ryouma pretended not to see. “I didn’t say haunted,” Raidou objected. “If you’ve got time.” Genma stepped back. “This is my team.” Was that pride in his voice? “Fans.” Pakkun flopped over heavily in the sink, causing a miniature tsunami that sloshed onto the floor. Fans happened. The temperature dropped a few degrees. Raidou directed the sanding and staining of the new floorboards like a happy general. There was an unexpected level of skill needed just to darken wood. Ryouma took to it with enthusiasm, wiping generous swathes of dark brown oil stain across the bright new boards. Kakashi followed behind him and neatened the edges where enthusiasm splashed over. The end result was a walnut streak across Ryouma’s forehead, dark half-moons under Kakashi’s fingernails, and a neat section of sturdy floor that almost blended. Not like stealing a jutsu or slaughtering an intelligent threat, but still tangible success. The lieutenant had a floor. And a roof. Next step: a home. Well, the next step was probably bathroom walls, but they needed more materials first. The storm growled outside, a colossal predator prowling through the sky. There was a brief, barometric tilt as the atmosphere swung out of balance, and then the hammer-strike of lightning restoring order. Kakashi’s blood sang with echoes. “So much for the storm being mostly over,” Genma said. The pressure fluctuated. Ryouma sneezed. Across the street, just visible through the rice paper windows, a white flash lanced down and struck something that exploded into sparks. The power blacked out. Goto swore and thumped downstairs to check the fuse box hadn’t melted. “Or glass windows,” Ryouma said. But he went readily to wrestle the shutters open. The old windows resisted him, sticking in their frames, but he managed to open a few before the wind banged them shut again. “Glass windows before winter, definitely,” Genma said. There was a small convenience store around the corner. Kakashi, as the only resident appreciator of a good storm, was volunteered for candle-fetching duty. He returned with several sturdy beeswax pillars, bottles of cold tea, onigiri for the famished, and the shopkeeper’s dour warning that someone had almost certainly hung themselves from the rafters and the warehouse was not fit to store shoes, let alone live in. Kakashi disliked her. Goto reported that the fusebox had survived its brush with the storm. Once lit and installed, the candles added a cheery glow between looming shadows. Genma, in his most calm voice, decided the east corner would be the best place to install his shrine. “Do you know what this was used for before silk?” Raidou asked Genma. “Happy housewarming,” Kakashi said, and liberated an onigiri before Ryouma could take them all. Grateful took a strange shape in Ryouma’s world. The demon queen had only had six legs, unless Ryouma was also including the pincers. And Kakashi was starting to suspect this conversation had gotten away from him. Kakashi snorted laughter. “Remind me to send them worms.” He hesitated for an undecided moment, then carefully propped himself against Ryouma’s shoulder, where he could watch the captain and lieutenant discuss important matters, like silk gods and bathroom studs. “I’d rather you didn’t smell like a candy-flower factory threw up on a morgue,” Kakashi said. “What’s wrong with scentless soap? Kakashi scratched the back of his head. It occurred to him, in all the times that he’d criticized Ryouma’s love of soap, he’d never actually explained why. “I’d need most of ‘em just to decide on one,” Ryouma said, without bite. Kakashi elbowed Ryouma in the ribs, mostly on principle, and tilted his head at the ceiling. The thunder was beginning to quiet again, slinking towards the horizon. The static pressure of lightning was easing off. Kakashi held back a sigh and resisted the urge to go storm-chasing. Kin had snuck over to sit between Genma and Raidou, tail thumping the boards as she listened to an animated conversation about bathroom fixtures. Raidou rubbed an absent hand over her ears. A moment later, Genma scratched the soft fur between her eyes. Kakashi felt his mouth tilt. The watery light coming in the windows had edged towards pink. Genma tore himself away from planning where to put the bathroom mirror and whether he’d need a bigger hot water heater to cast an eye over their accomplishments. The roof was patched, the floor reboarded and far more sound than it had probably been in decades. Three lighted fans hung from the ceiling, waiting for the power to come back on and bring them to life. Goto-san was just turning the screw on a bracket in the kitchen, hiding new wiring in dull silver conduit, ‘the better to avoid fire danger,’ she’d said. Genma had instantly agreed to that expense. It sounded like the rain had nearly stopped. “I can at least cover your emergency fee,” Genma said. He dug in his pocket for his wallet — it was damp, but the money inside was dry. Raidou followed him over to her to say goodbye. While Raidou saw her down the stairs, Genma turned back to his rookies. Pakkun looked despondent. Kakashi and Ryouma, tripoded against one another, didn’t seem much interested in getting back to work, either. Rather than expend physical energy, Kakashi clasped his hands together and materialized a clone. It gave him an unimpressed one-eyed look, and declared, “Lazy.” But it thumped down the stairs to start throwing broken boards into a pile. Ryouma wasted no time following suit, sending a clone of his own to help Kakashi’s. “Now beer?” he said. “Now we clean up here,” Genma said. He didn’t bother with a clone — there wasn’t much to do but sweep up some sawdust and stray nails, and make sure the cans of stain were sealed and the rags disposed of. Kin, whose enthusiasm for the day was undimmed by the prospect of work, and didn’t seem particularly interested in beer, followed Genma happily around, tail wagging and tongue lolling, as he tidied up the mess. “What ice?” Pakkun asked. He rolled over onto his back with his legs in the air again, head pillowed on a beer bottle. One paw twitched, sending a brown glass bottle clinking against its neighbor for emphasis. “The only drinking problem I have is not being able to get one,” Pakkun groused. “I said ‘fine,’ you whiner.” Kakashi hauled Pakkun out of the water and draped him over Ryouma’s shoulder. He rubbed the dog affectionately between the ears before rescuing the beer from the sink and shoving it back into Genma’s shopping bags. The wet dog dripping down his bare skin didn’t seem to perturb Ryouma at all. He hitched one arm around Pakkun to secure him in place, sighing as if he’d just applied an ice pack. “Sounds good to me. You can see all the way to Sarusawa Pond from there.” Genma reached for the bag of rice balls and other snacks. He went to the window to close it, then changed his mind. “May as well go out this way. It’s not like the neighbors are going to complain.” The neighbors being a grain wholesaler, a furniture maker, and a few miscellaneous additional warehouses for local merchants. They emerged from the window to find lotus-blossom colored clouds and clear-washed air, cooler now that the storm had blown through. A few of the growling thunderheads still congregated in the east, flickering lightning between them, but the setting sun cast a warm glow on the wet streets of Konoha below. They found a place where the roof slope was shallowest to sit, heedless of the damp seeping through their pants. Kin circled them like a herding dog trying to keep an eye on all her sheep at once, but finally chose a spot to settle once everyone else was seated. Beers went around. They’d neglected to bring up a bowl — not that Genma had dishes yet anyway — so Ryouma was appointed the task of lifting Pakkun’s bottle to slake the pug’s thirst. “He who bears the dog, beers the dog,” Pakkun announced, lying sprawled in Ryouma’s lap, immensely pleased with himself and his beverage. The light of mischief in Ryouma’s eyes when he grinned at Genma was impossible to resist. Are you thinking what I’m thinking? it asked. Let’s gang up on them. “Oh,” Genma said. “Yes. There is.” He peeled the cellophane from one of the onigiri. “First the main character loses his house in a flood and has to move in with his sister. I lost mine in a fire and moved in with a friend, it’s already totally different.” He took a bite of the rice ball and nodded at Ryouma to continue the story. Kakashi leaned in, intrigued. Raidou looked like he couldn’t decided whether to be horrified or exasperated. “It’s starting to creep him out a little, but the sister and her husband are fighting even more, and the kids are horrible little jerks, and he’s getting desperate.” Genma took another long swallow of beer, and passed the bag of snacks amiably to Raidou. Kakashi was completely hooked now. Pakkun was listening, too, although he was pretending not to. Kin got up from her spot to go lay her head in Raidou’s lap. He dropped a hand to her ears. “And?” Kakashi demanded. His tea rested on one knee, completely forgotten. And Raidou looked like he wanted to be anywhere else. His eyes were fixed on the distant hills, his expression one of practiced disinterest. He didn’t like scary movies. He’d told Genma that only a few weeks ago. It seemed he didn’t like scary stories, either. Ryouma looked at him like he’d gone completely crazy. “A lovesick shapeshifter crow,” Genma corrected. “Who thinks the main character is the reincarnation of her dead lover. There’s a little more. Want me to keep going?” He was wildly in the weeds now. Kakashi gave Genma and Ryouma puzzled looks, then caught sight of Raidou, and the dawn of understanding lit on his face — as much of his face as Genma could see, anyway — giving way to frank amusement. “That’s what Aoba says about my taste in beer, too,” Genma admitted, throwing his head back and draining his bottle. The warm light of the sunset had to be hiding at least a little of his blush, he hoped. “So how do they both end?” Kakashi asked. “I’m guessing also tragically,” Raidou said. Kakashi gave Ryouma a pointed nudge. “Details.” Pakkun opened one eye to add weight to the demand. Ryouma wasn’t sitting at a good angle to have seen Raidou’s face. And he presumably didn’t know about Raidou’s dislike of horror movies. It wasn’t Genma’s place to betray a confidence like that. “I must have fallen asleep during a double feature and gotten them mixed up,” he said. Which was so flimsy a lie the weight of a single grain of rice would have ripped it to shreds, but maybe Ryouma would let it slide. Or Kakashi would redirect, since Kakashi seemed to have clued in to the real problem. Kakashi gave Raidou an expectant look. Raidou was a little too old to get warm in the chest just because Genma had said friends, but he did all the same. They’d fixed a house. As a team. No one had fallen or bitten someone else or burst into flames. Ryouma had learned. Kakashi had listened. Genma, looking out over a village washed shining-clean, was smiling. Sagara had taken their side. It would have been a perfect moment, if they’d all been here. Kakashi’s chakra, relaxedly half-open, snapped closed. Ryouma’s restless hands went still. “She was re-assigned,” Raidou said, and wondered why Pakkun didn’t already know that. Didn’t Kakashi talk to his summons? “She left,” Kakashi said, with an acid bite. Pakkun blinked at his summoner, opened his mouth, closed it. Kin’s ears lowered. He’d burned the letter Katsuko had given him. Raidou wondered, not for the first time, what it had said. Raidou’s complete lack of surprise about the things Ginta knew could have been measured in acres. Ryouma had fallen silent again, one hand curled over his healed knee, the other resting on Pakkun’s narrow back. His eyes were doubtful. “What’re you thinking, Tousaki?” Raidou asked. Meaning: perhaps she’d already moved on. “If she had to stay in ANBU until she was willing to hug me, she would probably have died in her armor and mask at ninety-nine,” Genma said, squeezing and then releasing Ryouma. It wasn’t the first time Genma had shown them the unvarnished, un-lieutenant side of himself — that ship had sailed when he’d danced in a see-through shirt, and worse, when he’d broken down on the last mission — but it was the first time he’d done it sober, without duress, just to share a small piece of truth. Ryouma nodded once, mouth drawn down. Raidou glanced at Kakashi, who sat slightly apart from them. Kin had slunk over to rest her head on Kakashi’s foot. Her tail fanned anxiously. Ah. Right, Genma had mentioned something about that. Katsuko’s family sword style. That was months of practice, perhaps years. A gift, once offered and accepted, that forged a commitment. Neither Katsuko or Kakashi would approach that lightly. Or take the loss of it lightly, either. Hadn’t said a word. He’d burned his letter, and put his focus into helping Ryouma study. Ryouma shifted, eased Pakkun out of his lap, and moved down the roofline to settle next to Kakashi. Not quite touching, but a wall at Kakashi’s side. Kakashi tipped his head and gave Ryouma an ironic, I-see-what-you’re-doing look. Ryouma shrugged. “We’ve still gotta master Iebara’s jutsu,” Ryouma offered. “Any time you want to polish your taijutsu,” Raidou said. A month ago, that would have been genuine protest. Today, Raidou suspected that if the answer had been we start tonight, Ryouma would have jumped in with both feet. That drew a collective group snort. General feeling among Konoha’s adult shinobi was that Iwa could blow itself off the map and the rest of the world wouldn’t miss it. “She won’t be on Team Six again, though,” Ryouma said. “Me, too,” Pakkun said, hopeful. Kakashi handed Ryouma the beer he hadn’t drunk, and Pakkun re-draped himself very definitely over Ryouma’s knee. There was an ease about the three of them that hadn’t been there this morning. Kin had settled contentedly, head still resting on Kakashi’s ankle. Her eyes were half-closed. Kakashi’s hand rested on the back of her neck. Wordlessly, Raidou took a drink and handed the rest of his beer across. “One request,” he said. “Hatake doesn’t get to poison any of us while you’re teaching him,” Raidou said.